Tijuana/San Diego/California 905--this off ramp will go to the right and you go under Blvd 2000 towards the west into Tijuana. This street is called Blvd. Industrial. You take Blvd. Industrial for about 5-10 km. and pass a large art sculpture in the middle of the divided road. After that there is a nice Pemex gas station on the right that has nice restrooms and good gas prices. Continue on Blvd Industrial. You will come to and go past an intersection for De Las Bellas Artes. Then you will go over a large bridge and the next really big interestion has a sign for Garita de Otay--DON'T take it unless you want to go to the regular border crossing. Pas the intersection for Garita de Otay/Los Aztecas (same road) and then you will see a large public park on your right. At the first street past the large park there is an intersection for "Instituto Politecnico National" with a traffic light. Turn right here and go up to the next right "Alejandro Humboldt" and turn right again. There are two lanes on the left going east and if you stay in either lane you will automatically feed into the Ready Lane for the Otay Crossing. We went on a Saturday Morning (Thanksgiving weekend) and it was crowded. When we turned right onto onto "Instituto Politecnico National" therre was no problem until we tried to turn right onto "Alejandro Humboldt" where there was a policeman blocking traffic so you could not make that right turn. He made us go to the left down "Alejandro Humboldt" to the next intersection and do a U-turn back onto "Alejandro Humboldt" going east again. So, effectively you could take Blvd. Industrial to street "Via de La Juventude Ote" (the street where we made the u-turn) and turn right and go to up to "Alejandro Humboldt" and proceed east to the ready lane. We weren't sure if it was just extra busy that day so the policeman was diverting traffic. Either way will get you to the Ready Lane very easily. On Saturday morning over Thanksgiving Weekend we hit the Ready Lane at 9:00 and were crossed by 10:00. These instructions are very accurate and useful, we used them last Thursday. We drove up from the Rosarito area via the new Blvd 2000 and it was much better than using the Cuota Road (aka Scenic/toll Road) to Tijuana. We never did see the street sign for the Blvd Industial, but is sure seemed industrial! Like much of Mexico, street signs are not always easily seen or available to be seen. CAUTION: Watch for potholes in the road. When you turn right onto Alejandro Humboldt. stay in the left two lanes and they will feed you into the Ready Lanes. You will eventually see Ready Lane signs in English & Spanish on the side of the road. We noticed that previously there were only Ready Lanes on the left with Regular Lanes on the right, separated by Jersy Barriers, however, this time we noticed one or two REGULAR Lanes on the same side as the Ready Lanes (LEFT) of the Jersy Barriers. This may be due to the fact that if you repeatedly go thru the Ready Lanes without having the RFID card, they will 'detain' you and probably go thru all of your stuff for hours. Or at least this is what was alluded to by the ICE Agent on our first trip thru the Ready Lane at Otay. We had previously TRIED to use the Ready Lanes at San Ysidro but everyone with and w/o RFID cards were using them so they were backed up just like any regular lane and therefore SLOW! A couple of updates to this good information, as of Dec 2014. There is now an exit off the Ensenada-Tijuana toll road (1D) directly onto Blvd. 2000 with a toll. Making the right just past the park is a problem when the line on Alejandro Humboldt is too long (there will be police at barricades). Best to make the next right onto Via de la Juventud Oriente, then right onto Alejandro Humboldt. Our last time the end of the line was on Via de la Juventud Oriente. CONTINUE on Industrial Blvd up and over the business overpass. You will pass a McDonalds and a PEMEX on your right. After the PEMEX you will come to a stoplight intersection with a blue and yellow tire shop on your right. If you turn right at this intersection (Garita de Otay - Las Aztecas) you will be in the "regular" lanes to the US border. Continue on Industrial past Garita de Otay and the tire shop....you will be passing a large park or wooded area on your right.....turn right at the first street (Instituto Politecnico Nacional) after the park. Continue on Nacional (the park will again be on your right) past the park. You will pass two schools on your right....CETIS 156 and Segunda 29. Just past the schools, turn right on the first street - Alejandro Humboldt - (there should be a "Ready Lane" sign)......follow Humboldt.......this will put you in the Ready Lane lineup." but if you make it to that intersection you will be turned around due to construction. Currently the ONLY way to get into the Ready Lane lineup is to continue past the Garita de Otay sign at the tire shop and, staying in the right lane, merge onto the road for the Aeropuerto. About 1/4 mile down the road you will see everyone getting off at the exit that says San Diego I 5. That is the lineup for the Ready Pass lanes and is Alejandro Humboldt. Used the Otay Ready Lane today around 10:30------ 15 minute wait, but what a surprise as I found out the hard way, there is a different access from Blvd. 2000. The old way----- turn right at the light by the tire shop about 2 blocks past McDonalds. DON`T do this----- the Ready Lane is blocked off. So I took the ramp to Bella Artes, and made my way east and then south to get back on Blvd 2000. New way--- Go past the old turn, past a huge public park (1/2 mile or so).Take your first right (there is a light there), then go up to the next street and take another right. This will get you in the Ready Lane----- actually it`s really easy! If you are on Corridor 2000, take the signed exits to San Diego or Garita de Otay. This will put you on Industrial Blvd. Continue on Industrial Blvd and you will pass under a footbridge with "PANASONIC" written on it. Up and over the "new" overpass, you will pass a McDonalds on your right. For easy access to the Ready Lanes, Proceed past Garita de Otay (the tire shop) continuing on Industrial Blvd. Turn right onto Blvd Lazaro Cardenas (may also be marked as the route to the Tijuana Airport) . 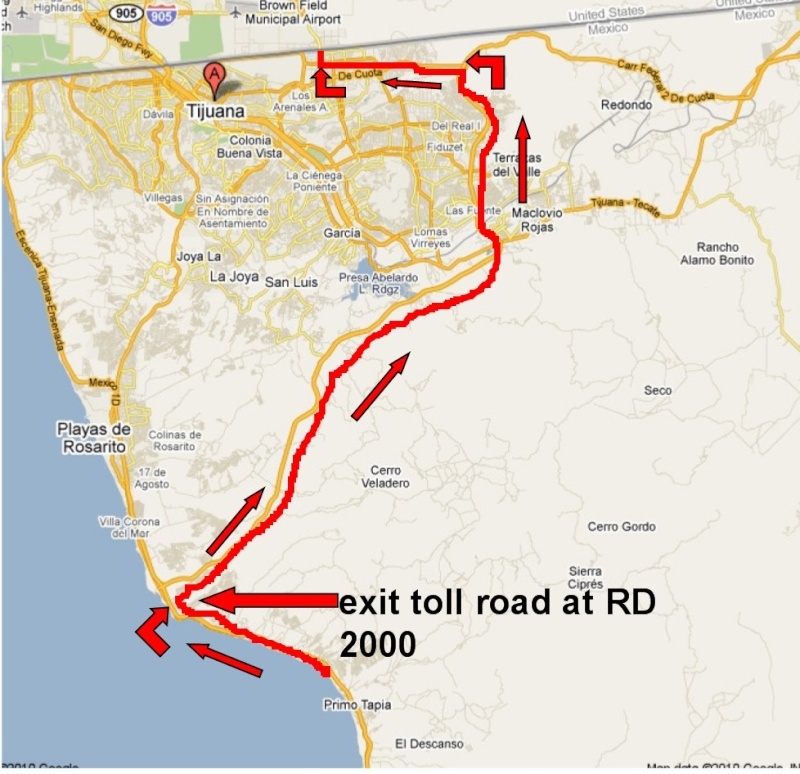 UPDATE 2/2012 going north from Ensenada on hwy1 there is now a toll both at the blvd 2000 exit so do not get off at cantamar/puerto Nuevo. Yes, fellow Nomads, the long awaited northbound Mex 1 toll road off ramp in Popotla to Corridor 2000 is now open. Two toll booths available, and the toll is 25 Pesos. Unfortunately, no sign of any work on a southbound on ramp. Only those with such documents are allowed in the lane, which is scheduled to be open 4 a.m. to 8 p.m. Monday through Friday and 8 a.m. to 10 p.m. on weekends. U.S. Customs and Border Protection officials say all adults 16 and over must have approved card. These include more recent U.S. passports, the SENTRI card, new legal permanent resident “green cards” and a new Border Crossing card. This was from August in I think BPE, crediting someone from namad. here is another set of directions by someone that I followed and it worked great, I just took this and here are some pictures to help. and it seems like you are on this very nice 4 lane empty road for a long time. you are and you can not miss the huge signs instructing you to turn for otah mesa. so just keep going ... these are the largest signs you will ever see in Mexico. also after you are on the side streets getting close to otah mesa, on the road to the crossing, take the overpass to bypass the the traffic, either way will get you there so do not worry about thinking you went the wrong way. IMHO this way is much better than the tacate road. - Take Puerto Nuevo off ramp, head North on "free road"
- When you get near Otay, it turns into Blvd. Industrial, stay on Industrial for about 4 miles. - Two blocks past the McDonalds, at the "Garita Otay" sign, turn right and stay in right lane for border crossing. - Once you are on the US side, the 905 will take you to the 805 and 5 in about 10 or 15 minutes." You can see the intersection of H2 and the toll road (exit from Toll Road to H2 is not open) on Google Earth. The exit to the Free Road is much earlier and is visible on Google Earth. The turn-off to the free road is: N32 15 03.12 W116 56 40.72. The intersection of the free road with H2 is: N32 17 03.96 W117 01 56.79. According to my gps, its about 5.6 miles from the "Free Road" to the intersection with H2. If anyone takes the new route, give us some feedback, please? Proceed north on the toll road from Ensenada. Exit toll road at the Cantimar or Puerto Nuevo exit. Proceed north on the free road to Popotla. You will pass the Calafia resort on your left and come to a Mexican military checkpoint. After you clear the checkpoint, get into the right lane, There will be a “T” intersection (to your right) with stoplights (not functioning) and a stop sign. Turn right. This will be BC Mex 201 or Blvd 2000. May also be marked as Corridor 2000. Proceed approximately 26 miles on BC Mex 201……(Blvd 2000).. Follow the signs for Garita Otay/Tijuana/San Diego/Tecate/Mexicali You will pass from a rural area to an urban area. Be aware of cross traffic and pedestrians. 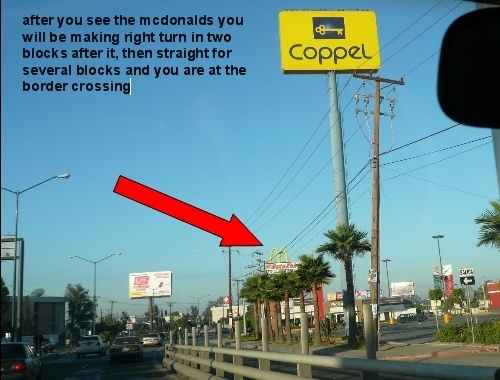 You will also pass a Commercial Mexicana on your right and a Home Depot on your left…….when you pass the Calimax on your right, move into the right lane. At about the 26 mile mark, there will be a sign indicating a ramp to your right for Tijuana/San Diego. Take this ramp which will put you on Industrial Blvd………if you go straight, you will end up on the toll road to Tecate!!!!!!! Follow Industrial Blvd west for approximately 5 miles. You will pass under a “Panasonic” footbridge, and up and over the business district overpass. Just past the McDonalds you will come to a stoplight controlled intersection (Garita de Otay) with a tire shop to your right. Turn right here for the “regular” Otay crossing which is approximately 1 mile ahead. As you proceed west on Industrial Blvd, you will pass under a “Panasonic” footbridge. There will be a fire station on your left, and you will come to a stoplight controlled intersection with a PEMEX station on your left. This intersection is Jose Lopez Portillo Oriente. There is a school on your right and another school at your 1:00 position. Turn right at this intersection and proceed about 4 blocks to a major 4-way stoplight intersection. This intersection will be Bella Artes. Turn left onto Bella Artes and proceed about 4 blocks. You will come to a stoplight intersection (Josefa Rendon Ibarra). .....OK the tricky part….there is a car wash at your 1:00 position….turn right onto Ibarra as if you were going into the car wash …….but don’t!!!! !....continue your right turn, center up on Ibarra and you will be on a direct course for the Otay SENTRI lanes……..
NOTE…….if you drive past the car wash and do not turn right as directed above, take the on ramp on your right just past the car wash. This will put you into the regular crossing lanes for Otay. it has a few more pictures not shown here. if you go to the left onto the bridge/overpass it will make your trip easier. if you want to go to the mcdonnalds for a bathroom stop, be in the right lane. I have a picture of that next. go to the left onto it. and here are a few other signs you will see. turn here at tire shop, to the right at the below sign. then in several blocks you hit the border without turning. stop and use the mcdonnalds bathrooms they are clean. if in a RV it is recommended that you use far right lane because of mandatory secondary inspection. 5/16/2011 you can no longer exit to the left, all vehicles after the booth go right. not a big deal... they just have not removed the signs that say you can. this road is a 4 lane divided hwy, with a huge median. Very little traffic on it except tt the walmart area is but you to not have a stop sign or traffic light on it at all. Slow down by the walmart area because buses let people out right on this road and they run across. Just stay on this road till you see the sign below it is huge, you can not miss it and go right at it. .to san diego.... it goes to Otay Mesa. here is an update 10/2013 after about 7 miles, just before the walmart area where there are many businesses they have added a new exit that you do not want to take, it caught me off guard so no picture(sorry). but just stay to the left do not go on the split to the right. if you have not gone past walmart when you see these new confusing signs stay to the left direction. and you will be fine. after the walmart area about 5 minutes you will then see the below signs to exit at. I used the two peoples directions above and made it with no problems. above is a general map of what you are doing. and if you want a print out go to this link http://la-ventana.com/contact%20info.htm click on ensenda to Otah Mesa there are some additional photos on that site. update 2/2012 do not exit HWY 1 , at Puerto Nuevo/Cantamar exit. 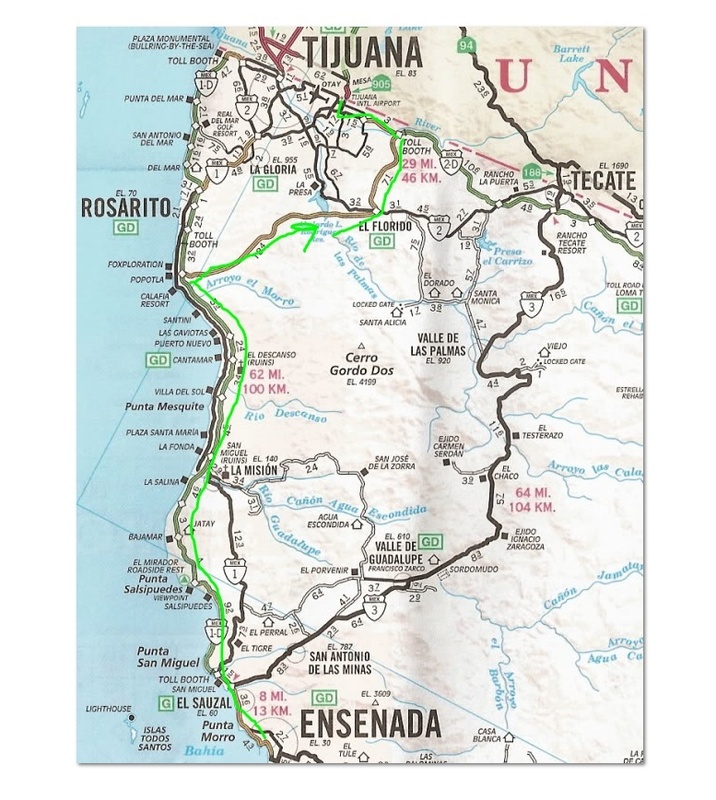 , this is roughly 40-50 km north of Ensenada on 1D toll road, at KM marker 50 or as you get to the first toll booth 29.5 miles ahead, you do not hit the second toll booth. *****now you want to exit at rd 2000 they now have a toll booth there. I moved the written descriptions to the bottom of the thread. Here is a general map of what you are doing. I suggest that if you have a cell phone, you call a friend as you hit Ensenada and have them check the website of the homeland security boarding crossing times. http://apps.cbp.gov/bwt/ send that link to your friends and have them give you the crossing times of the three potential crossings. that way you can determine which you should cross at. Call them for an update, and call them back in 5 minutes when they have the information, after all your cell phone minutes may be expiring. also in Ensenada the McDonalds by the walmart has open wifi. note do not exit till the blvd 2000 toll both, this is new... 2/2012 this will be shortly after the Puerto Nuevo/Cantamar exit. Within this thread there are three different peoples directions to do this and mine with pictures. This road R2000 is a fantastic road and is 4 lanes divided and free. I really reccomend taking this vs tecate or the main TJ crossing. Becasue of the details it makes it look complicated, but it is not. this is easier than any other route to cross the border.